Featured blog #8 The blogger is known for a different approach in every photograph and drawing on her posts. Her artistic abilty is not the usual "perfect touch" approach but rather a personal touch that ends up to be unique and beautifully executed. My blog serves as an online outlet of self-expression, thus the very personal touch to it. It's a mixture of everything I think I do: I write there, I show my photos, my drawings, the food I eat, stuff I do for school, etc. I always try to convince myself that my life is not boring at all. I also hope to keep things interesting in my blog so that backtracking it in the future would be a breeze. Whenever I do a post, I try to make it "very me" by writing on the photos and even drawing on my face when I want to. I'm Athena, I just turned 20 and a graduate of Bachelor of Fine Arts : Industrial Design from UP Cebu. I'm an aspiring photographer and designer, but I do a lot of other things in my spare time. I like doing self-portraits, reading, taking photos of stuff and people, and doing artsy-fartsy stuff. I love Oreos and the Internet too. write better, photograph better and see the progress even in my blog's little space. I named my blog "Noting Athena" because I wanted something easy to remember with my name on it. Apparently, the "noting" part is easy to remember but some people read it as "nothing", which makes me laugh sometimes. 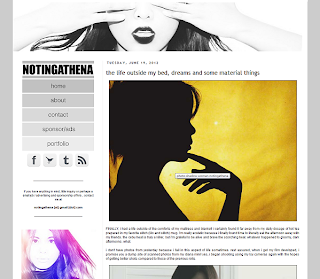 My blog ( notingathena) has been around for five months now. It's still very young since I just started again after being frustrated by the last one I had. I am very happy with this space now, and I hope it will be here to stay. I've been blogging since high school, but every time I start a blog, I usually get tired after a few months or so. I either shut them down or just leave them with no more updates. But a few months ago, I felt like I should just blog again because it's nice to have a place to express oneself and interact with fellow bloggers. My favorite blog post as of now is The Red Herring at 3/24 because my friends and I had a small photoshoot after being frustrated for not being able to push through with our thesis defense that day. This is quite memorable because the lighting used was LED lights from a lamp I designed. honestly, I'm thinking where did you got the "noting" term. First came into my mind is the noun "note" that leads to "noting" as the verb. Alright, I think I'm rambling here but anyway, just want you to know you're one of my favorite photobloggers in the FBW community. You're exceptionally talented. Don't stop on that, i believe it's your way to success. Athena's truly an artist and she has a unique and exciting approach on how she presents her topic. Nice feature you got there. I have been a constant follower of Athena forawhile now. The blog certainly has something unique to offer. It's one of my favorite personal blogs since Athena really shoots great photos! I agree. Her photos are not the usual kind. There's something deeply personal to them. so unique and dashingly gorgeous, even the the drawings. two thumbs up!!! i have seen the blog of athena and it is really a great blog..
thank you so much for the feature, FBW! My second time here! I love this group!